Lunch – spaghetti and garlic bread, cream of mushroom pork chops and rice, chili, hot dog, edamame rice and pastele stew. Sweet Treats – poi crunch, butter mocha, mochi dessert, lilikoi cupcakes, brownies, shortbread cookies, banana bread, oreo cookie rice krispies, captain crunch bites, and pumpkin crunch bars. If you would like to view more pictures visit our company Facebook fan page – Hawaiian Tel FCU at https://www.facebook.com/hitelfcu. 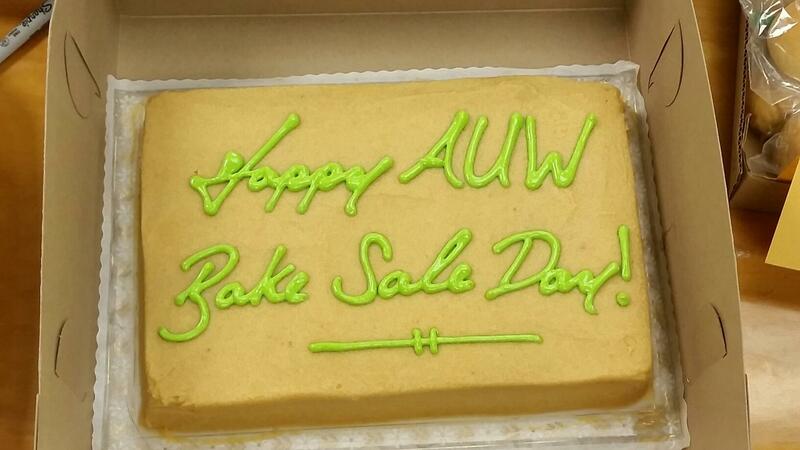 For more information on AUW and how to get involved, visit their website at www.auw.org. This entry was posted in Kalakoa Musings and tagged 808state, aloha united way, alohastate, AUW, bake sale, Bishop Street, comebelong, community, credit union, Downtown, ewa beach, finance, food for days, fortstreet, Halekulani, hawaii, hawaiian tel fcu, helemai, hitelfcu, honolulu, Kaimuki, Kalihi, Kapalama, kapolei, kunia, mccully, mililani, mycu, ourcu, Schofield, Sheraton, support, Wahiawa, Waikiki, waipahu, webelong, Wheeler AAF, youbelong by Hawaiian Financial Federal Credit Union. Bookmark the permalink.